IF you know that you should be involved in blogs, and all the other new tools of the internet, but are not too sure where to start, then I am involved in a blogging workshop next week where you can get your hands dirty. I am working alongside Paul Fabretti, of digital agency KMP, to provide a half-day course in starting a blog, how to source story ideas, key design elements in a blog, promotion of the site and how to follow the conversations and connections being made around the web, plus whatever else is playing on your mind. But crucially we will have computers you can use to try things out letting you investigate tools and websites there and then, because the best way to learn is to start tapping away on the keyboard. 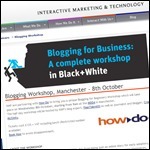 The blogging workshop takes place on Wednesday, October 8, in Manchester and tickets are priced £125 + vat, for more details see Blogging for Business: A Complete Workshop in Black and White. 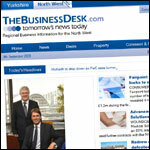 IF you want to get a handle on some of the most interesting and appealing blogs in Manchester before next month's awards then check out the shortlist of sites on Manchizzle. The winners will be announced at the blog awards event on October 22 at Matt and Phred's Jazz Club, on Tib Street. I KNOW a few PR pals follow the site so I thought I'd point you to Robin Hamman's presentation and notes on learning to listen to the conversations taking place online. I WAS recently tagged by Louise Bolotin who wrote an interesting piece about the 'embarrassing' products she uses, despite having a keen eye on the environmental side of things. I must admit that I don't use a great deal of stuff that might be considered dangerous in an environmental way, I'm a fan of bicarbonate of soda and the various recipes you can create with it, especially after reading my pal Tracey's writing in The Book of Rubbish Ideas.